What is a Stroke, and what causes it? Stroke, basically has to do with brain damage. Our brains control us. Memory, sight, feel, touch, judgment, colour and senses are all controlled by the brain. It controls our actions too. The brain needs oxygen in the blood to work. This means each time there is a slight starvation of oxygen to the brain for any reason, there can be great damage (stroke) to the person. Ischaemic stroke is more common and accounts for about 8 out of every 10 stroke cases. It occurs when the artery (blood vessel) is blocked by a blood clot, which interrupts the brain's blood supply. Sometimes a blood clot will occur anywhere in the body and travel to the brain. There, it can enter a smaller blood vessel and block the supply of blood, causing a stroke. This is called Embolic Stroke. Blood clot strokes can be the result of unhealthy blood vessels clogging with a build-up of fatty deposits and cholesterol. If this occurs for a very short time (about 10-15 minutes), Transient ischaemic attack (TIA) will occur, which is also known as mini-stroke. Patients usually recover after, and the damage is usually light. TIAs are a warning that something wrong is going on. Haemorrhagic stroke, on the other hand occurs when blood vessels in or around the brain ruptures, causing bleeding in and around the brain. Here again, there are two types. 1. In intracerebral haemorrhage, vessels within the brain may burst, usually as a result of high blood pressure. 2. 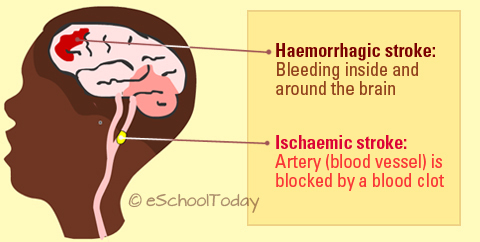 In subarachnoid haemorrhage, an artery may burst outside the brain, but blood spills to delicate membranes surrounding the brain. This makes the fluid filled membranes contaminated with blood. Diseased arteries - A mixture of cholesterol and other debris may cause blockage of the arteries, causing stroke. Aneurysm - a weak spot on the artery around the brain wall may stretch, become thin and burst, causing bleeding into the brain (haemmorhagic stroke). Atrial fibrillation - this kind of irregular heartbeat (arrhythmia) can cause a blood clot to form in the heart, which then travels to the brain.